This is the 2nd card I made yesterday. After gathering all the elements from various challenges the creating began. 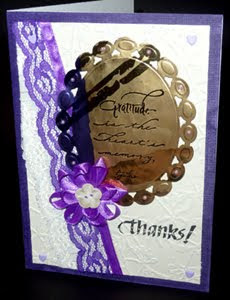 The die cut is recycled from a box of Purdy chocolates I got from a coworker/friend. I'm using a quote and a sentiment stamp both from Quietfire Design. Fab card Yogi - great idea to recycle. Great bit of recycling and like the lace too! Great card and how clever recycling the foil. hanks for joining us at Phindy's Place and I hope we see you again next week. Gorgeous card! I love the lace!! Thanks for Cooking it up with Katie this week! Thank you for joining us this week for the Phindy's Place challenge. I hope you will join us again soon! Don't forget to check with us on Thursday if you have won or made the Top3 and what our next challenge is. Love the angled lace and the wonderful glittery details on the background ... thanks for sharing your White Glitter goodness at Gingersnap Creations.